Rule-based modeling involves the representation of molecules as structured objects and molecular interactions as rules for transforming the attributes of these objects. The approach is notable in that it allows one to systematically incorporate site-specific details about protein-protein interactions into a model for the dynamics of a signal-transduction system, but the method has other applications as well, such as following the fates of individual carbon atoms in metabolic reactions. The consequences of protein-protein interactions are difficult to specify and track with a conventional modeling approach because of the large number of protein phosphoforms and protein complexes that these interactions potentially generate. This section demonstrates the basic functionality of the BioNetGen language (BNGL) and RuleBender, which is the BioNetGen IDE. Obtain BioNetGen, RuleBender, and NFsim by following the directions at BioNetGen quick start. Java and Perl must be installed. The BioNetGen Quick Reference Guide summarizes much of BioNetGen and its ecosystem in four pages. RuleBender comes with many sample models written in BNGL. Open the birth-death model by clicking on File -> New BioNegGen Project -> OK -> Select a Sample -> birth-death -> Type Project Name ‘birth-death_test’. The null (0) reactants and products in these rules allow A to be created from nothing and destroyed without a trace. These rules aren’t mass balanced, of course, but ignore that for now. What population do you expect the model will predict for A? How do you expect the population to vary over the 50 sec for the ODE and SSA models? 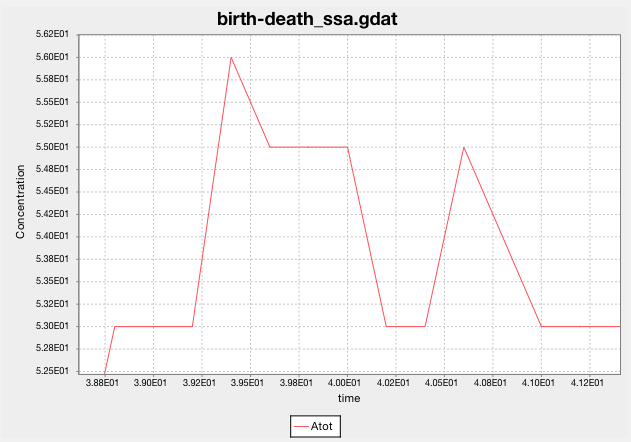 Now look at the results by clicking on the birth-death_ode.gdat and birth-death_ssa.gdat and tabs. Did you anticipate the model’s predictions? whose solution is \(A = 50\), as predicted by the ODE solver. Note that ODE integrators approximate species populations (or concentrations) as non-negative real numbers, whereas populations are really non-negative integers. 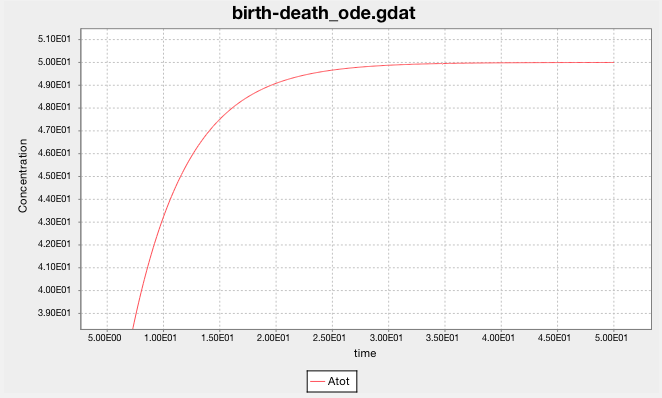 You can visualize this in RuleBender by zooming in on the birth-death_ode.gdat plot. Select a rectangle of the plot from upper-left to lower-right to see the smooth, real-valued predictions. Look at SSA’s predictions for the population of A. What happens when you greatly increase the simulation’s end time (t_end)? Zooming in shows that SSA predicts the population as a non-negative integer at each sampled time step. You can find the raw inputs and outputs for each simulation run in the results subdirectory of the birth-death project. What happens when you change the rate law constants? Adjust them so the equilibrium population is 200. Adjust them so that the model does not reach an equilibrium. Can they be adjusted to reduce the variance of the SSA predictions? In this section we create a new BNGL model. Follow chapter 3 of the Rule-Based Modeling of Signal Transduction: A Primer. Make a new project by clicking on and typing File -> New BioNegGen Project -> OK -> Select a Sample -> template.bngl -> Type Project Name ‘signal_transduction’. template.bngl provides a template BNGL program with initialized blocks.